Two youthful hunters watch an instructor point out the vital points a hunter must hit to get his buck at a training course in gun safety held at the Winnequah Gun Club near Lodi in 1953. Fall in the Northwoods means hunting season for many people and has been that way for many generations. There are numerous stories out there about the spiritual side of hunting and how some look to their time in the woods as a chance to reconnect with nature and get in touch with something primal within themselves. The ideal is a beautiful thing, but the actual experience is often something quite different. 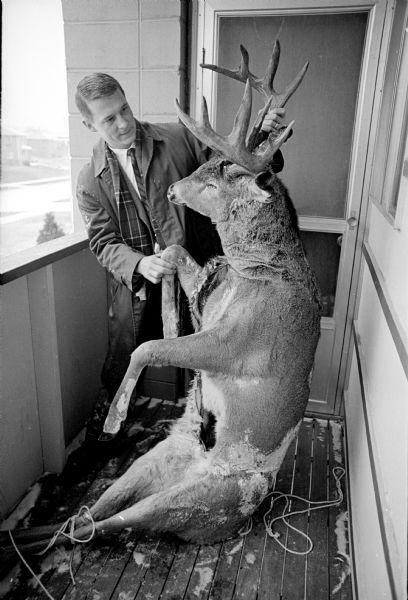 Jim Herubin displaying the 14-point buck which he shot during the deer season in Douglas county, back in 1964. Take a Thanksgiving hunt that Erwin J. Steenson of Minocqua experienced in 1948. In that year Steenson and four others had spent the Thanksgiving week out in the woods in search of the perfect buck. After six fruitless days, the group was cold, wet, and tired, so they decided to pack it in and head home. Then, all of a sudden, while driving on Highway 51 two miles south of Minocqua the group spotted a huge 10-point buck standing majestically on the side of a nearby hill. The hunters could not believe their luck. The car screeched to a halt as the men spilled out onto the highway and pulled their rifles out of their gun cases as fast as they could. Leaving the cases strewn about the roadside, the men crept into the brush and hurriedly loaded their weapons in the hope of getting off the first shot. Despite the commotion the men were making, the buck stood its ground as the hunters spread out and took aim. The first hunter got into position, raised his rifle, and fired! Several more shots followed in quick succession. After everyone had taken their shot, the buck continued to stand. Convinced that they had fired too low, the huntsmen encouraged each other to aim higher. One of them warned his fellows to watch the buck carefully. “He may be hit,” he said, “it’s their trick to stand still and then suddenly run off.” They fired another volley, and this time saw fur fly. The buck still stood. They fired yet again. Finally, after other motorists had stopped to watch the show – or in some cases join in the shooting – a couple of the hunters crept up the hill to see what was going on. They returned with sheepish looks on their faces. They discovered that some prankster had placed one of the finest stuffed bucks they had ever seen on the side of that hill. People resumed shooting, and by the time Steenson and his group left he estimated that more than 500 rounds had been fired into the hapless stuffed animal. If hunting creates memories, then this was a hunt definitely worth remembering. I’m Gary Entz and this has been a WXPR Northwoods Moment in History.